Euro-zone growth is slowing before the European Central Bank boss can end asset purchases or join the Fed’s Jerome Powell in raising rates. One-off factors may be to blame now but a downturn is inevitable. Unusual policy will be the norm rather than the aberration in Europe. European Central Bank (ECB) President Mario Draghi testifies before the European Parliament's Economic and Monetary Affairs Committee in Brussels, Belgium, February 15, 2016. 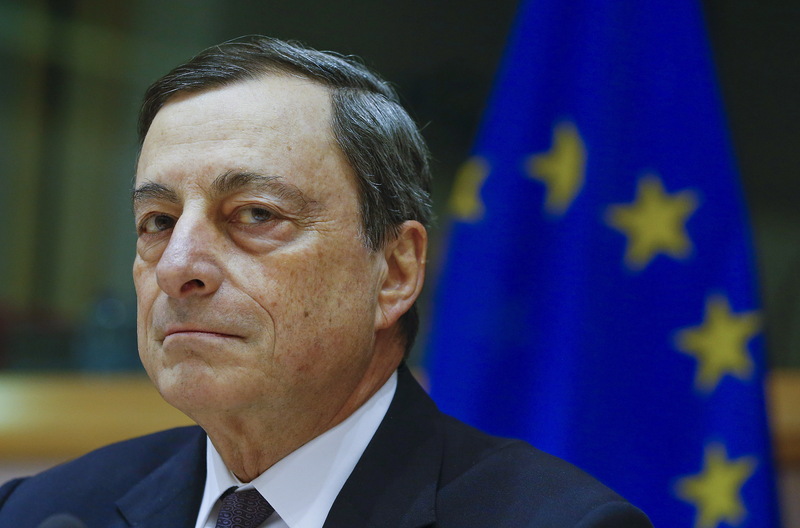 European Central Bank President Mario Draghi said on April 26 that euro-zone economic growth remained strong but acknowledged evidence of a “pullback” from exceptional growth readings. The ECB’s Governing Council on April 26 left its deposit rate at minus 0.4 percent, its main refinancing rate unchanged at zero, and took no decision on whether to extend its asset purchases beyond September. The central bank currently buys 30 billion euros a month of securities. The council will decide in June or July whether to continue purchases or wind the programme down.